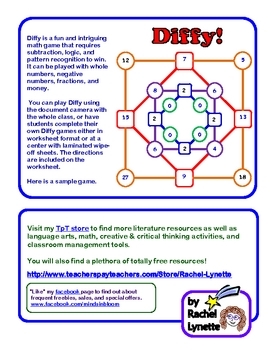 Diffy is a fun and intriguing math game that requires subtraction, logic, and pattern recognition to win. 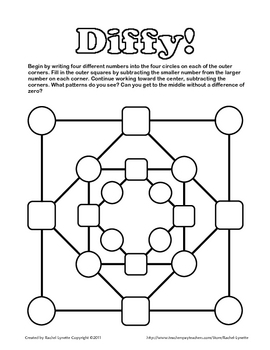 It can be played with whole numbers, negative numbers, fractions, and money. This game is challenging for both kids and adults! 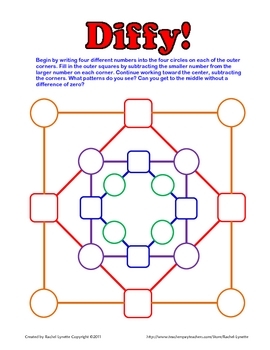 You can play Diffy using the document camera with the whole class, or have students complete their own Diffy games either in worksheet format or at a center with laminated wipe-off sheets. These cards will look best in color, but will also print out fine in grayscale. Simply print and cut along the guidelines. Laminate and use them again and again. Alternatively, you could print on cardstock. It works well to keep them in a baggie. Another option is to hole-punch a corner of each card and put them all on a ring. Purchasing this product grants permission for use by one teacher in his or her own classroom. If you intend to share with others, please purchase an additional license.